This is the third of four posts on reforming English education in Japan. You can see my thoughts on elementary school here, and on junior high school here. High school is a crucial step within Japan’s English educational system. It is the gateway to university, and currently has the most powerful external incentives for students. Get into the right high school, and you’ll have a shot at a good university. Graduate from a good university (and let’s face it, once you get in it’s not very difficult to graduate) and you’ll be set for life. That’s how the script used to go. It’s shifting now, which is why we are seeing change on the horizon. Here is my take on high school English education in Japan. Most students attend junior high school then go to a separate senior high school. 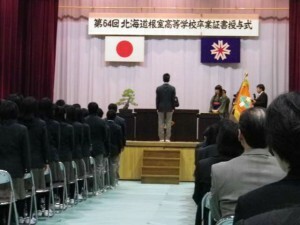 Entry is competitive, and students take the high school test or take advantage of a parallel ‘recommendation’ system (suisen). The system is designed to select candidates based on academic achievement and potential. Once in high school, students focus on preparing for university entrance tests (if they attend an academic-track high school) or on getting vocational qualifications (if they attend a vocational high school). From this month all high school English classes are supposed to be taught in English (something that was also part of the 2003 Course of Study but was not successfully implemented) but we will have to wait and see how widespread this turns out to be in practice. Ironically, English classes at vocational schools are often more practical than classes at academic schools. Freed from the pressure of cramming huge amounts of vocabulary/grammar for the university tests, teachers are free to work at the students’ level and have them work on their communicative competence. Sadly many teachers instead do an ‘academic lite’ class, reviewing junior high school vocabulary/grammar. The falling number of children due to demographic change is putting a lot of pressure on high schools. The best public and private schools still have students competing to get in, but other schools are becoming less able to select as they only get as many applicants (or fewer) as they have places. The governments plan to use TOEFL to screen applicants to university (which I disagree with) also has the potential to shake up SHS education. This has three parts: teach students why input is important and how they can access it, expect students to do a certain amount of input-based self-study per week, and monitor their progress. Done well, this can have a significant effect on practical English ability, as well as helping students become independent learners. This should include extensive reading with graded readers, as well as online listening and watching videos. Students should be speaking and writing ‘real’ content regularly. Writing their reactions or ideas, giving speeches, and having discussions about topics of interest will help them build up their language proficiency. Give students the opportunity to interact with news and current issues through English. This can include reading online, simplifying news stories for the classroom, and using contemporary stories as the basis for output activities as described above. I would like to see the government create meaningful English qualifications that students could take to demonstrate their ability. At the moment, the STEP Eiken, the TOEIC, and to a limited extent the TOEFL tests fulfil this role at the moment, but they don’t do a very good job of measuring overall English proficiency, particularly with regards to speaking and writing. Perhaps some kind of language portfolio would be the best way of achieving this. The qualifications would ideally be recognised by universities and employers, and provide incentives for students to work on developing actual English skills. Based on best practice worldwide (see the Khan Academy or online university courses for examples) create online content using the best teachers. By flipping the classroom in this way, students can use class time for practice and interaction, and learn concepts for homework, in an environment where they can repeat or rewind as much as they need. This would have the welcome side-effect of reducing the importance of cram schools for university entrance. It would also reduce the influence of unqualified or unskilled teachers (only 50% of senior high school teachers hold intermediate English qualifications). I struggled writing this one. By the time students get to high school, they’ve already had five years of English at school. Any problems have been compounded and it is unlikely that high school alone will revolutionise their experience. For the same reason, changes here will probably have less effect than they would do in elementary school or junior high school. Still, the fact that students are academically streamed should make it easier for teachers to deliver content appropriate to most of their charges. Many young people I speak to were profoundly disappointed when they started high school and found that the classes were a continuation of what they had been doing in junior high school. They had honestly been expecting to have things step up a notch and become more challenging/practical. What do you think? Is senior high school English a lost cause? What practical steps could we take to improve English classes? Ben wrote: “From this month all high school English classes are supposed to be taught in English”. I think the actual wording included the catch phrase “in principle” or “mostly”, which leaves a lot of wiggle room for that Japanese teacher to revert back to Japanese. Interesting points. Though you mentioned one of the big reasons why the government/its business buddies don’t want change. Cram schools. It’s such big business here that they’ll fight like crazy to keep it that way. I think the main reason they teach Japanese in schools here is as a ‘challenge’ for students to overcome as opposed to a useful language that will increase their career prospects. They purposefully make the curriculum difficult and confusing. Or am I way off the mark?! Thanks for commenting. I think that used to be the case, that English was a exercise in academic differentiation (like Latin in the UK), but recently the government and businesses have become aware of how lack of English skills might be holding Japan back. For one example, the only university with 100% graduate employment last year was Akita International University, mainly because of their strong language and intercultural skill-building. It’s also suddenly become one of the most attractive universities for students to apply to. Yeah, I’m in Akita actually! Was surprised to learn AIU has only really taken off in the past 5 years or so. It was a failing US branch uni before that, I believe. I think you’re right and the decision-makers are starting to feel the threat from developing countries with better English speakers (i.e Korea 😉 but I’m not sure if they can swallow their pride and move away from the grammar-translation based curriculum and the obsession with ‘reading’ tests that don’t test productive skills. Let’s see!